adapter to reduce electron and X-ray signals from the SEM stage. 2-The TEM grids are clamped down by the top plate and a central brass screw. electron and X-ray scattering interference from the holder. TEM samples are very thin and therefore don't exhibit signal originating from bulk. This enables improved surface imaging and increased spatial resolution. These are clear advantages for SEM/EDX studies of thin films, fine dispersions, inclusions, precipitations and low-Z materials. 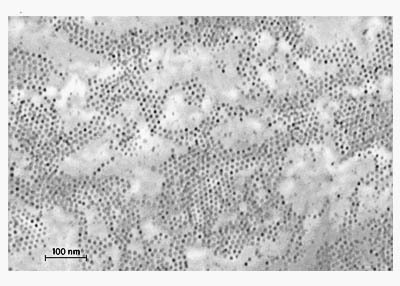 An SEM or rather FESEM can also be used to check TEM samples or lamellas made with a FIB before inserting in a TEM. EM-Tec TG4 pin stub based TEM grid holder for up to four TEM grids. Numbered positions with machined pockets and side grooves for loading/unloading the TEM grids. The TEM grids are clamped down by the top plate and a central brass screw. Through hole size is Ø2.1mm with a 60° side angle on top and base to reduce electron and X-ray scattering interference from the holder. Overall size is Ø18x3.2mm with a 15mm long standard 3.2mm pin. The longer pin creates a distance from the stage adapter to reduce electron and X-ray signals from the SEM stage. EM-Tec PS11 mini pin stub holder for a single TEM or FIB grid. TEM grid rim rests on a ledge; in the middle of the cavity there is dimple to provide a non-touching area for the mesh of the grid. Groove is provided for easy loading/unloading of the TEM grid with fine tweezers. The TEM grid is not clamped. 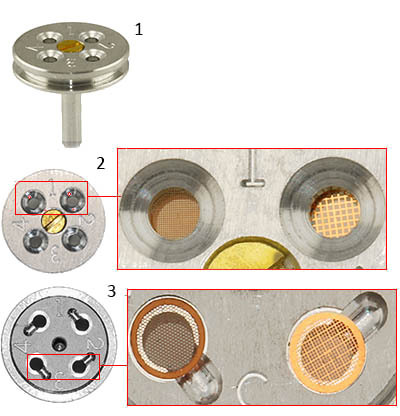 This holder is used for quickly checking a TEM grid in the SEM or as a TEM grid holder for a carbon evaporator. 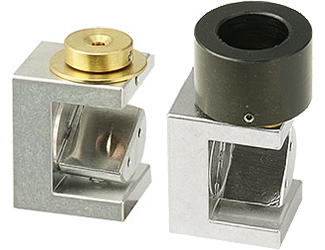 EM-Tec PS14 mini pin stub holder for four TEM or FIB grids. TEM grid rim rests on a ledge; in the middle of each cavity there is dimple to provide a non-touching area for the mesh of the grid. Grooves are provided for easy loading/unloading of the TEM grids with fine tweezers. The TEM grids are not clamped. This holder is used for quickly checking up to four TEM grids in the SEM or as a grid holder for a carbon evaporator. 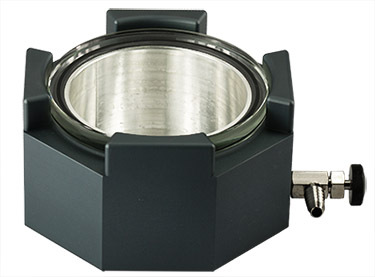 All three EM-Tec TEM grid holders are only available with a standard 3.2mm pin. They can be used on other SEMs, when an EM-Tec SEM stub adapter is used. The EM-Tec ST1 STEM imaging holder facilitates STEM imaging of TEM samples in an SEM or FESEM. The EM-Tec ST1 STEM imaging holder uses the Everhart-Thornley SE detector in the SEM chamber. The TEM grid is placed in the STEM imaging holder and de holder is positioned under the electron beam (typically in de centre of the SEM stage). The TEM sample is scanned with the electron beam and the STEM image is formed by converting the transmitted electrons, which hit the platinum conversion plate, into secondary electrons. The secondary electrons (holding the STEM image information) are collected by the SE detector in the sample chamber. It is advised to use high accelerating voltages (25-30kV) and thin samples to increase the transmitted electron signal. The STEM imaging detector is provided with a black conductive plastic electron absorption sleeve which is placed between the polepiece and the EM-Tec ST1 STEM imaging holder. The sleeve absorps the secondary and backscattered electrons emitting from the sample surface. *) The height of the EM-Tec ST1 STEM imaging holder is 29.5mm; with the electron absorption sleeve the height increases to 37.5mm. The EM-Tec ST1 STEM imaging holder is a cost effective method to add STEM capabilities to your SEM for a fraction of the cost of a dedicated STEM holder and detector for your SEM. The STEM imaging holder image quality rivals that of a dedicated STEM detector system. The limiting factors are sample thickness and accelerating voltage of the SEM. Ordering Information for EM-Tec TEM grid holders and EM-Tec ST1 imaging holder for SEMs using pin stubs; FEI, Philips, Tescan, Phenom, Aspex, RJLee, AmRay, Cambridge Instruments, Leica, CamScan, ETEC and Novascan SEMs.